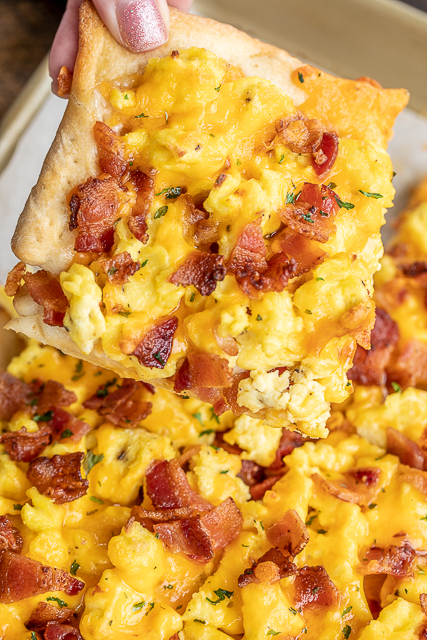 This Cracked Out Breakfast Pizza is a favorite in our house. 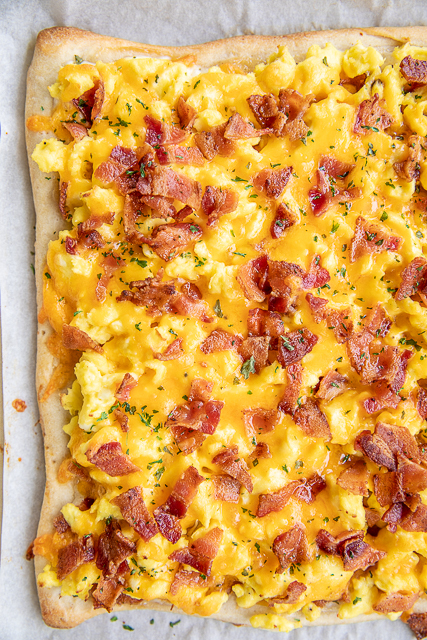 Breakfast pizza loaded with cheddar, bacon and ranch - OH YES!!! We love to eat this on the weekends, but it is easy enough to make during the week. 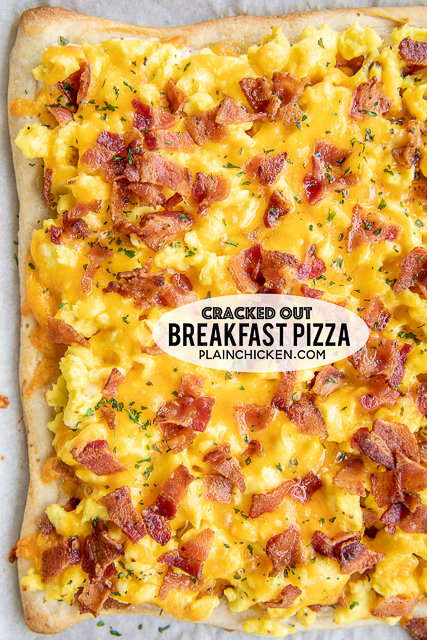 I used a refrigerated pizza crust for this Cracked Out Breakfast Pizza. You can certainly use a homemade crust if you prefer. To cut down on the prep time, I used precooked bacon. I LOVE using precooked bacon for recipes like this. I usually buy a giant bag of precooked bacon bits from Costco. It the real bacon pieces not that weird hard fake bacon. Saves so much time and money! Bacon is super expensive! 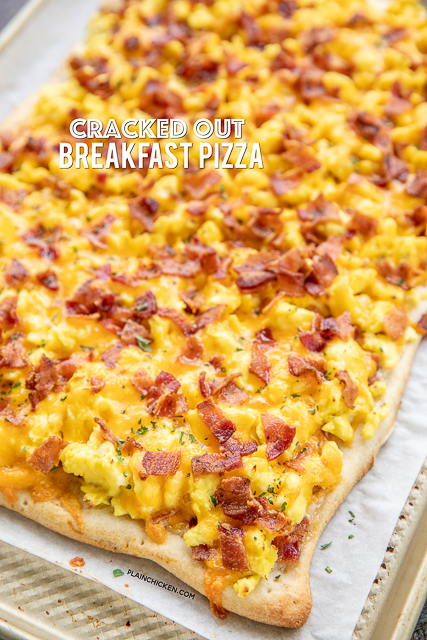 We LOVE this easy Cracked Out Breakfast Pizza. It is great for breakfast, lunch or dinner. It would also be great for some of those early football games this Fall. Give this a try this weekend. I promise it will be a hit!! Preheat oven to 400°F. Line a 15x10x1-inch pan with parchment paper. Unroll pizza dough and press bottom pan. Prick thoroughly with a fork. Bake 7 to 8 minutes, until lightly brown. While crust is baking, whisk together eggs and milk. In a nonstick skillet, heat butter over medium heat. Add eggs; cook and stir just until thickened and no liquid egg remains. Spread Ranch dressing over partially baked crust. Spread cooked eggs evenly over crust. 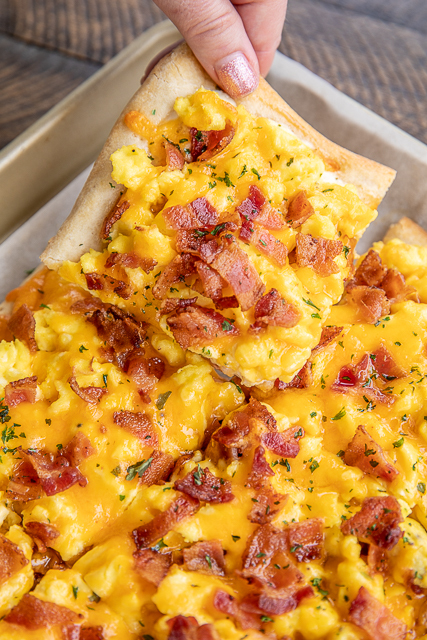 Top with bacon and cheese. Bake and additional 7 to 10 minutes, until cheese is melted and crust is brown. I really dont want Ranch dressing with eggs. :) And I always add country or sausage gravy mixed in or over the top.